Black Berkey water filters are the most powerful gravity water filters currently available on the market in the UK. The design of the Black Berkey water filters is based upon the original ceramic filters which were first developed in England in 1827, this water filtration technology has been in constant use since then. The Black Berkeys were designed approximately 15 years ago as water purifiers and are a significant improvement upon the original ceramic water filters. In fact, the Black Berkey water filters have been tested with more than 10,000 times the concentration of pathogens per liter than is required by standard test protocol. This concentration of pathogens is so extreme that the post filtered water would be expected to contain 100,000 or more pathogens per liter (99.99% reduction - the requirement for pathogenic removal). Incredibly the Black Berkeys removed 100%. Absolutely no pathogens were cultured from the purified water or were able to be detected by an electron microscope, setting a new standard in water purification. The Black Berkey water filters have been found to be so effective, they are able to remove red food coloring from water without eliminating the essential minerals your body needs. To the best of our knowledge no other water filter can duplicate this performance. 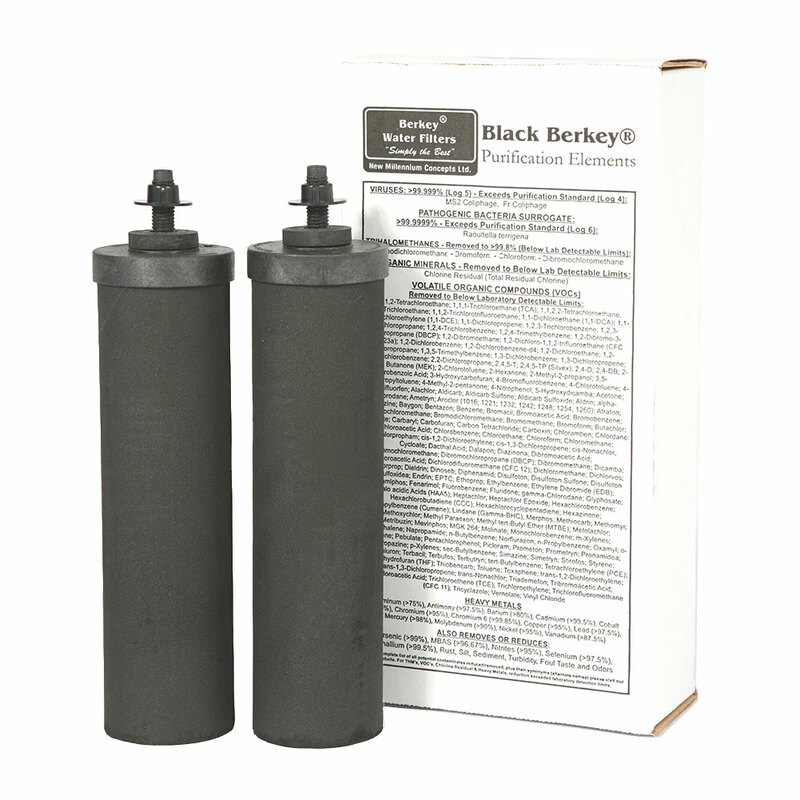 Black Berkey water filters are re-cleanable, there is no need to purchase expensive disposable filters. If the flow rate decreases simply brush the Black Berkey water filters with a ScotchBrite pad under running water, re-prime, re-install and your system is again ready to purify water. Each Black Berkey filter will last for up to 11,350 liters (22,700 liters per set of two) and provide you with years of reliable water purification. For instance; If you were to use 38 liters per week, this is equivalent to 600 weeks. That's more than 11.5 years of clean water! Another unique characteristic is that the Black Berkey water filters are self-sterilizing. The unique design of the Black Berkeys combines the tried and tested method of micro-porous filtration together with modern state-of-the-art technology and the highest quality materials to bring you the finest water purification system available on the UK market. The micro-pores within the self-sterilizing and re-cleanable Black Berkey water filters are so small that pathogenic bacteria are simply unable to pass through them. The materials used within the Black Berkeys remove contaminants by a surface phenomenon known as “adsorption” which results from the molecular attraction of particles to the surface of the media. The Black Berkeys are also impregnated with proprietary “absorbing” media that promotes ionic “absorption” of pollutants within the micro-porous filters. Another reason gravity filters and in particular Black Berkey water filters are so effective in removing contaminants from water is the extremely long “period of contact”. Most water filtration systems are attached to the mains and rely upon water pressure to force water molecules through the filters at 60-90 PSI. These water molecules only have a fleeting contact with the filter, mere fractions of a second. By comparison, water molecules passing through the “Tortuous Path” structure of the Black Berkey water filters, are drawn gently by gravity and stay in contact with the filter for a much longer period of time. This leads to the filter being much more effective and efficient in capturing impurities. For example, if you were to throw 100 steel ball bearings from a distance of 5 feet at a large magnet, some would stick but most would likely bounce off. However, if you were to walk over and gently place the ball bearings on the magnet most, if not all, would stick to the magnet. Black Berkey water filters fully utilize this principle of gentle capture. This advanced technology was developed, refined, and proven through years of diligent, investigative research and testing performed by water purification specialists, researchers and engineers. The flow rate or time of exposure through the exclusive Black Berkey water filters has been calculated and proven to yield the greatest volume removal of the ever increasing load of toxic chemicals dumped in our fresh water by industry and agriculture. Do the Black Berkey water filters reduce Bromates? • Bromate (BrO3-) is composed of bromine and oxygen. • Bromate reduction has been reported in several studies to be achieved by the mechanism of adsorption to attract bromate to the surface of carbon-based media. Bromate is then reduced down to bromide (Br-). • Black Berkey® water purifiers utilize activated carbon in our proprietary formulation. • The Environmental Protection Agency (EPA) has listed dichloroacetic acid as a surrogate chemical for bromate. Surrogates are compounds similar in chemical composition to the analytes of interest and spiked into environmental samples prior to preparation and analysis. They are used to evaluate the efficiency of removal or reduction of other contaminants that react similarly. • Black Berkey water filters reduce dichloroacetic acid by greater than 98.00%. Nevertheless, since NMCL has no specific testing for bromate, we cannot make any specific claims for bromate reduction. Factors that could have an impact on any reduction would include the concentration of the bromate contamination, as well as other competing contaminates in the water.